3 Russian service members were killed in a terrorist attack in Syria in late February, the Russian Defense Ministry said on March 25. 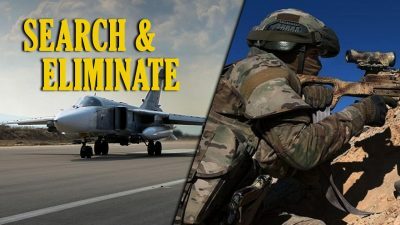 The defense ministry added that following the attack the Russian Aerospace Forces and Special Operations Forces tracked and eliminated a group of 30 terrorists linked to the attack. The defense ministry provided no details regarding the location of the incident. However, the ISIS-linked news agency Amaq claimed earlier that ISIS members had killed several Russians in attacks in the Homs-Deir Ezzor desert. Most likely, the terrorist group was referring to this incident. At the same time, a video of the supposed UAZ vehicle, in which the Russians were moving, when they came under attack is circulating online. It was reportedly filmed in 40km from the town of al-Mayadin. This incident is further undeniable evidence that despite the formal defeat of ISIS’ self-proclaimed Caliphate in Syria, cells of the terrorist group still pose a threat to local security. So far, the limited security operations of the Syrian Arab Army (SAA) in desert areas near Palmyra and the Euphrates Valley have not been able to put an end to the terrorist group’s presence in the Homs-Deir Ezzor desert. According to the Syrian-Iranian-Russian alliance, ISIS terrorist use the US-occupied area of al-Tanf to hide from SAA operations. Furthermore, the US is still denying any access to the al-Rukban refugee camp located in the area and is in fact preventing evacuation of civilians from the area of the humanitarian crisis. On March 26, the Turkish Defense Ministry announced that Turkish and Russian forces had conducted a first patrol in the area of Tal Rifat. “Within the framework of the previous agreement, the Turkish Armed Forces and the Russian Armed Forces carried out the first independent but coordinated patrol in order to achieve ceasefire, provide stability in the Tal Rifat area and prevent attacks on our elements,” the Defense Ministry said in a Twitter post. The patrols reportedly covered the following areas: Kafr Lusin and Al-Dana in northern Idlib, Atarib in western Aleppo, and Qammari and Al-Eiss in southwestern Aleppo. In fact, Russia and Turkey have still not launched any really ‘joint’ patrols at the contact line between areas controlled by the so-called ‘opposition’ and the government. Another important point is that these first patrols covered mostly calm areas. Most of the ceasefire violations are taking place in northern Hama and southern Idlib. On the other hand, the Tal Rifat development may become a fist signal indicating that the guarantors of the de-militarized zone agreement are going to undertake practical steps to put an end to the continuing presence of terrorists in the area.